(Newser) – Crown these Royals the American League champions. After nearly three decades spent trying to return to the playoffs, Kansas City is taking its perfect postseason ride all the way to the World Series. With more dominant defense, an opportunistic offense that plated two runs in the first inning, and a bullpen that shut down the Baltimore Orioles once again, Greg Holland and the wild-card Royals wrapped up a sweep of the AL Championship Series with a 2-1 victory today. Next stop: The Royals' first World Series since 1985. They'll face the winner of the NLCS between the Giants and Cardinals. San Francisco leads that series 2-1. Thursday, 10:25pmCDT And so it is ; ROYALS vs giants in The World Series. Maybe we will sweep The World Series as well ! This is good for baseball. Small markets need to know that they have a shot at it. I hope they win it all. YEE HAW ! 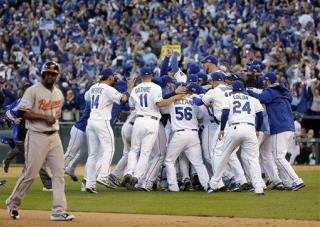 My KC ROYALS do the double sweep. First time in history to win the straight 8. Bet that record holds for many years / decades, or more.